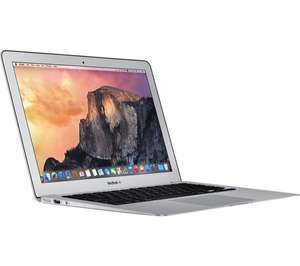 Get the MacBook Air (2017, 128GB, 1.8GHz, 8GB RAM) for approx. £600 only! Here's how: Barclays was offering cashback of 10% at the moment at Curry's/PCW (now 1%) + Curry's/PCW is offering a cool £125 trade in special offer for any working laptop in decent condition (traded in a 5 year old Compaq Celeron). Curry's/PCW is price matching Argos' current deal price on this product at £799 online (in store is £ 879). These 2 offers bring the price down to below the £600 mark. Without cashback it's £675 - which is a very good price in itself. Alternatively Barclay's was also offering 10% cashback on Argos (now 1%) + the £10 Argos voucher for spend over £100 (maybe even the 5% Fast Track collection promo pass offer for £5 could be clubbed), particularly if you don't have an old device to trade in. Stupid question probably, but do I have to bank with Barclays to get the 10% off? Logistically, how would this work with the trade in and Cashback? I thought you had to buy online for Barclays Cashback? This is another curry's non existence deal, someone keeps posting these for at least two weeks now!! Even without the employee discount and Barclay discount, you can get this for £674 with trade in - that's' a very good price. However, it's only 128GB disc capacity. The 256 GB version can be got from Curry's for £950 via price match with Argos (less the above discounts). I got this for my daughters university work - mostly essay writing and surfing the net - 128 GB more than sufficient. Can always put in a SD card or USB for extra disc capacity if/when required. I've just got a quote for my trade in online, only got offered £25. Go instore - the trade terms and conditions state they will give you MINIMUM £125 provided your laptop powers on and working. I took my crappy intel celeron 6 year old laptop and they valued it at £125. I also took my 10 year old Dell pentium 4 laptop which has a screen flickering problem (estimatated cost of repair -£150). weights a ton!!! and they offered me £125 for that too. Does anyone know if a netbook counts as a laptop that you can trade in? Logistically, how would this work with the trade in and Cashback? I …Logistically, how would this work with the trade in and Cashback? I thought you had to buy online for Barclays Cashback? click through from Barclays to Currys > reserve a Mac > go instore to collect, take old laptop and take advantage of trade in > wait for cashback from barclays? Barclays seem to suggest any codes used will impact eligibility so this trade in may also be considered a promotion that will void it. Can I trade in Non UK laptops as well? Barclay's T&C's don't explicitly deny CB for trade-ins (couldn't find anything specific in the T&C's, trade-ins are not a regular code as there is a physical exchange of merchandise/value); it has tracked so will know by end of Jan.. not keeping any fingers crossed as CB is never 100% reliable.. lol. In any case - as you pointed out, it was a great deal even without and the CB (if it comes through) would just make it sensational.. This is another curry's non existence deal, someone keeps posting these …This is another curry's non existence deal, someone keeps posting these for at least two weeks now!! Photos of receipt and laptop or I'm right again. Been loads of these this passed two weeks, and given your new account and complex nature or achieving this deal, I would be suprised if this isn't spam. Photos of receipt and laptop or I'm right again. Been loads of these this …Photos of receipt and laptop or I'm right again. Been loads of these this passed two weeks, and given your new account and complex nature or achieving this deal, I would be suprised if this isn't spam. Are you kidding- the deal is easily verifiable without asking for confidential information (receipt). So if I do provide you the details (and you are proved "wrong") will you stop trolling & delete your account on HUKD? why has this been expired? 'cos the CB has dropped to 1%.. however you are right that the Curry's deal is still on..